Many of us learned to read dragging our finger across the paper to avoid getting lost. 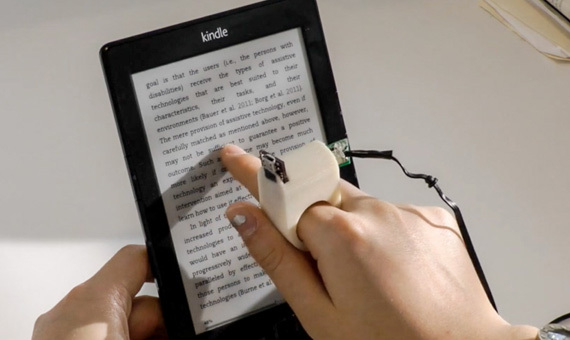 This intuitive gesture can help blind and visually impaired people to interpret printed text through a ring-like device that is able to recognize text and read it aloud. The ring, developed by researchers at the MIT Media Laboratory, uses an algorithm specially created to recognize words, which in turn are then sent to a program that reads them aloud. As the person moves his/her finger across the page, the device emits signals –in the form of sounds or vibrations- to prevent switching lines unintentionally. In its current stage of development, the ring must be connected to a computer that interprets and reads the text, but its creators are already developing a version that could run on a mobile phone. 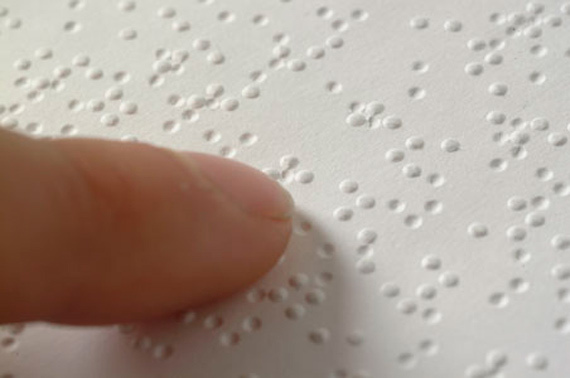 Although there are solutions that can convert text into speech, Braille remains the closest thing to reading for blind persons. There already are devices capable of reproducing Braille characters in real time, but they are based on moving parts that go up and down to form points of symbols. However, these devices cost thousands of euros and their functionality is limited. A device developed by a Harvard University engineering student could offer a different solution. Named “Ferrotouch” by its creator, Katie Cagen, the device is a sort of tablet that uses a ferrofluid –a kind of liquid metal- under which a matrix of electromagnets is placed, and which is then coated with a flexible surface. The magnets interact with the ferrofluid to create recognizable shapes on the surface. This device would not only be capable of recreating Braille symbols, but it could also represent any type of pattern, from points and lines to complex shapes such as graphs, diagrams and other figures. 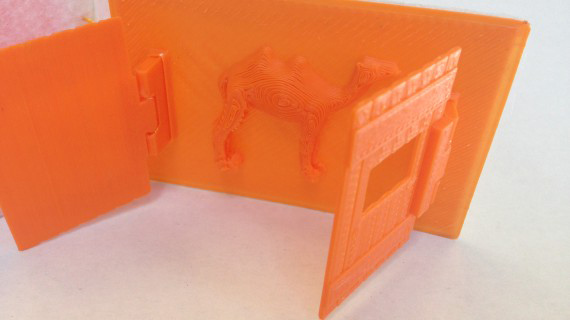 This project, led by researchers at the University of Colorado, aims to turn children’s books into a tactile experience through the use of 3D printers. In this way, children with visual disabilities could “touch” these stories as their parents read them aloud. Generally, blind children do not start reading Braille until the age of six. According to the promoters of this project, 3D printing technology can offer children and their families the opportunity to start reading at an earlier age while allowing them to start exploring the world with their own hands. Most blind people preserve some form of vision, often limited to the perception of light and movement.The smart glasses developed at the University of Oxford take advantage of this residual vision to enable the blind to get their bearings and move through unknown environments. The glasses use a system comprised of cameras and software to detect nearby objects and present them in a form that is recognizable to the user. Its creator, Dr. Stephen Hicks, has already created a prototype and is seeking funding for its industrial production. If successful, they could become available on the market later this year at a price equivalent to that of a mid-range smartphone. KNFB Reader: A picture of a printed text is all that is needed for the app to read it aloud. It can be configured to read different types of documents and is capable of guiding the user through voice commands and vibrations to help him/her put the camera in the right position when photographing the document. Tap Tap See: Similar to the app above, but specialized in identifying objects. A picture is enough for the application to describe the photographed object. This application combines automatic image recognition systems and the help of real people who interpret the images. It can be useful, for example, to get a description of a room inside which the user has never been, find out the color of an item of clothing or distinguish a packet of normal coffee from a decaffeinated one. 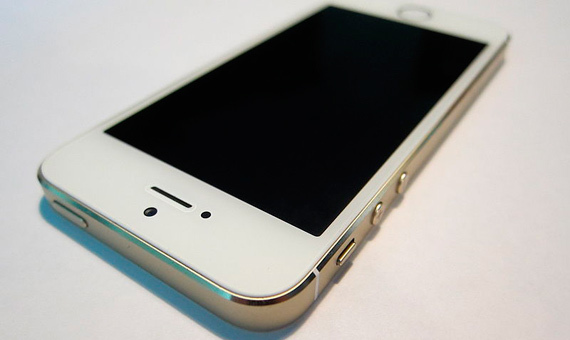 Coin Identifiers: Many apps identify banknotes quickly. This app is useful to find out how much money you have in your pocket or to check that the shopkeeper gave you the correct change. Color ID: Although it may be useful to graphic designers and people working in similar occupations, blind people may often need to know the color of objects; for example, when taking clothes out from the washing machine.